Since the telephone was invented in the early 20th century, the landscape of commerce and business has been transformed forever. Telecommunications paved the way for faster, easier, and more reliable means of communication. Whether you needed to order more manufacturing materials, contact an important client, or halt an order at the drop of a hat, telephone systems make your business run smoothly. 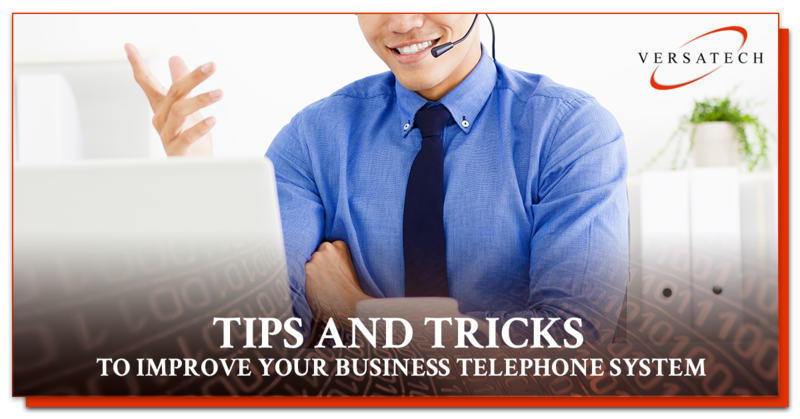 Today, we are looking at some tips and tricks to improve your business’ telephone system. If you’re still using technology your father used, it’s time to upgrade and unlock the potential of using the latest advances in telecom technology. At VersaTech in New York City, we provide both hosted and on-site telecom solutions. Whether you need a cloud phone service, PBX consulting, or improved VoIP telephone systems, Versatech is here for you. Call us today at 212-725-0100 for a free consultation. As you sit down to either start a business or access what infrastructure upgrades you need to complete to increase the efficiency of your mid-market enterprise, make sure you honestly evaluate your business’ phone systems. If you neglect to move with the latest innovations in the telecom industry, you will find it harder and harder to do business as efficiently as your competitors. Be sure to stay on the cutting edge by following these suggestions for improving your business telephone system. It may seem scary at first, but using a VoIP business phone system has many advantages over staying with traditional PBX hardware. At its core, VoIP (Voice over Internet Protocol) utilizes the internet rather than phone lines for all of your business calls. Whether you’re calling someone on the other side of the building or the other side of the country, VoIP is more affordable and offers greater flexibility. VoIP takes advantage of your internet’s infrastructure. As a result, you won’t have to install PBX hardware systems. While PBX systems are reliable, they force the user to anticipate future needs by buying large-capacity servers before the user can even use them. On the flip side, VoIP is scalable, meaning you can adjust for seasonal swings in your business. One of the best providers for VoIP services is RingCentral, and VersaTech happily provides consultation and installations services for those wanting to upgrade to a VoIP phone system. It is extremely important to have your customer relationship management (CRM) system integrated with your business telephone system. When both of these systems are working in sync, it will allow your employees to keep track of their clients and customers more efficiently. If you pair your CRM system with a VoIP business phone system, your employees will be able to access client contact information from virtually anywhere in the country. If you opt to go with a VoIP service that allows mobile devices to access the network, your employees that travel for business can always be kept in the loop if you take advantage of linking your CRM with your VoIP phone system. No matter where your employees are in the country — granted they have internet service — you can transfer calls, conference call, and create unified messaging for either your employees or your clients. At the rate that technology is advancing, few can predict what phone systems will look like in 15 or 20 years. However, we can make predictions that things are moving more and more towards cloud hosting, and away from physical on-premise hardware. For some businesses, on-premise hardware is incredibly important, while others value a hosted cloud service. If your business needs hardware and on-site telecom solutions, one of the best solutions is Avaya’s IP Office, which is one of the more flexible and scalable, on-premise, business telephone solutions on the market. If your business is ready to make the jump into the next level of efficiency in their internal and client communications, consider using VersaTech to get the job done. Our trained professionals are happy to provide a host of different telecom solutions for your business. Whether you are just starting or want to upgrade, VersaTech is here to help you. Schedule a free consultation today to find out which telecom system is right for you.